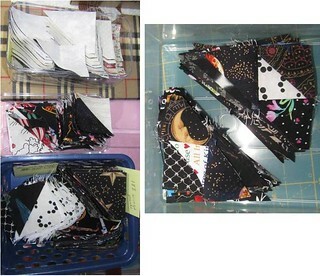 Well sometime back in January I started on Bonnie Hunter's mystery quilt called Orca Bay. I wanted a challenge...and boy oh boy is it a challenge! These were the first pics I posted back in April/May. 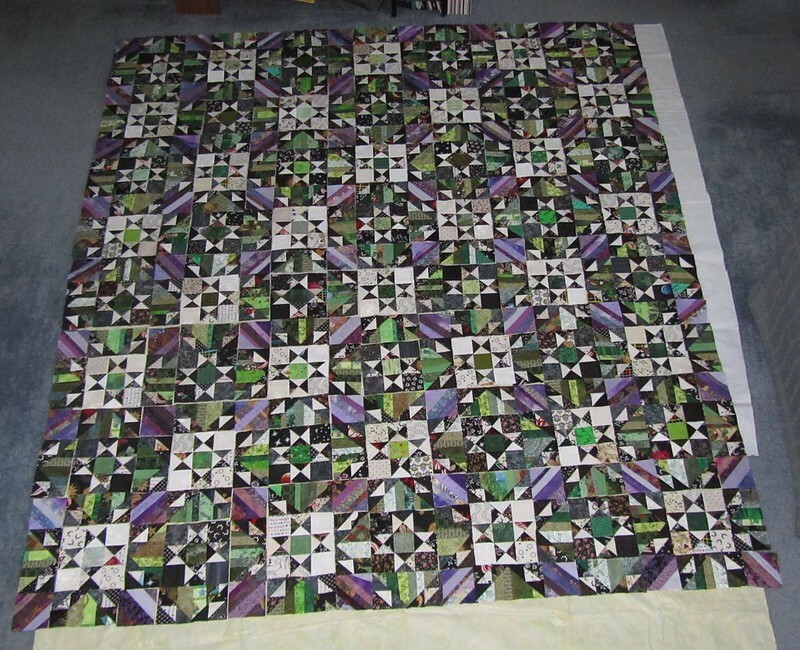 Last week I finished piecing all the little blocks to make the centre of the quilt top. Thanks ladies. Well I've started sewing it together. Sewing sections together vertically...so from the left have the sections sewn up to the end of the first 4 stars. Hard to describe, but I'm sewing it together using Bonnie Hunter's method that she calls "Webbing the Top" (http://quiltville.blogspot.ca/2005/06/webbing-top-or-how-to-chain-stitch.html). She demo'd this method to piece blocks last year when I was on the cruise with her. 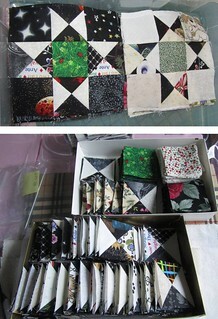 Since then I've been using her method to piece patchwork blocks esp. when I pieced all these Ohio stars. It's great to keep all the patches in the right order. But I've never tried to do it for an entire top before. So...this is my first attempt. So far so good...although it is strange to press all the blocks in one long row. My word, that is amazing! Well mostly to keep me motivated, I thought I'd post where I'm at as of lunchtime today. I've been using Bonnie's webbing method and it's going not too bad at all. It certainly is great to keep all the pieces organized. I have the left side sewn together vertically which are making horizontal rows. 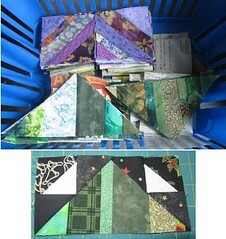 And they are all joined together via the stitching between the vertical seams of the blocks. Right now I can pick up the top row and the whole thing lifts up. The right side is 7 columns sewn into three rows which still to be joined together. Once they are joined, then I will sew together the left and right sides. After that I will start sewing all the rows together horizontally. When I do this, I just may clip some of the webbing to divide the top into 4 sections. I think, due to weight, it will be easier to sew the horizontal rows. We'll see as I get there. Judy, I so admire your patience with complex patterns The finished product will be stunning. Is it for you? Enjoy the weekend, no snow for us yet Take care. Oh my goodness, that is a lot of tiny pieces! I can't imagine keeping them all organized and in the right place. icetbear wrote: Is it for you? temom wrote: Oh my goodness, that is a lot of tiny pieces! I can't imagine keeping them all organized and in the right place. You have to develop a system...and I found Bonnie Hunter's system of webbing the top works fantastic. The top is now totally sewn together in horizontal rows. I just need to sew the horizontal seams to join the together. But I took a break yesterday and didn't work on it at all. Oh yeah...A camera definitely helps in keeping the parts organized. So far...I've only had to look at my pic once to make sure a section was not upside down.